Microsoft states that SharePoint has 190 million users across 200,000 customer organizations. There are various editions of SharePoint which have different functions. SharePoint Server is provided to organizations that seek greater control over SharePoint's behavior or design. This product is installed on customers' IT infrastructure. It receives fewer frequent updates but has access to a wider set of features and customization capabilities. There are three editions of SharePoint Server: Standard, Enterprise, and Foundation (free) which was discontinued in 2016. These servers may be provisioned as normal virtual/cloud servers or as hosted services. Communities: 'MySites' (personal profiles including skills management, and search tools), enterprise wikis, organization hierarchy browser, tags and notes. Search: Better search results, search customization abilities, mobile search, 'Did you mean? ', OS search integration, Faceted Search, and metadata/relevancy/date/location-based refinement options. Composites: Pre-built workflow templates, Business Connectivity Services (BCS) profile pages. Microsoft's hosted SharePoint is typically bundled in Microsoft Office 365 subscriptions, but can be purchased outright. SharePoint Online has the advantage of not needing to maintain one's own server, but as a result lacks the customization options of a self-hosted installation of SharePoint. Microsoft lists changes in SharePoint Online on its Office Roadmap. SharePoint usage varies from organization to organization. The product encompasses a wide variety of capabilities, most of which require configuration and governance. SharePoint allows for storage, retrieval, searching, archiving, tracking, management, and reporting on electronic documents and records. Many of the functions in this product are designed around various legal, information management, and process requirements in organizations. SharePoint also provides search and 'graph' functionality. SharePoint's integration with Microsoft Windows and Microsoft Office allow for collaborative real-time editing, and encrypted/information rights managed synchronization. This capability is often used to replace an existing corporate file server, and is typically coupled with an enterprise content management policy. A SharePoint intranet or intranet portal is a way to centralize access to enterprise information and applications. It is a tool that helps an organization manage its internal communications, applications and information more easily. Microsoft claims that this has organizational benefits such as increased employee engagement, centralizing process management, reducing new staff on-boarding costs, and providing the means to capture and share tacit knowledge (e.g. via tools such as wikis). SharePoint contains team collaboration groupware capabilities, including: project scheduling (integrated with Outlook and Project), social collaboration, shared mailboxes, and project related document storage and collaboration. Groupware in SharePoint is based around the concept of a "Team Site". This capability is often compared to services like Box or Dropbox. WebDAV can be used to access files without using the web interface. However, Microsoft's implementation of WebDAV doesn't conform to the official WebDAV protocol and therefore isn't compliant to the WebDAV standard. For example, WebDAV applications have to support the language tagging functionality of the XML specification which Microsoft's implementation doesn't. Only Windows XP to Windows 8 are supported. SharePoint's custom development capabilities provide an additional layer of services that allow rapid prototyping of integrated (typically line-of-business) web applications. SharePoint provides developers with integration into corporate directories and data sources through standards such as REST/OData/OAuth. Enterprise application developers use SharePoint's security and information management capabilities across a variety of development platforms and scenarios. SharePoint also contains an enterprise "app store" that has different types of external applications which are encapsulated and managed to access to resources such as corporate user data and document data. SharePoint provides free-form pages which may be edited in-browser. These may be used to provide content to users, or to provide structure to the SharePoint environment. Web parts and app parts are components (also known as portlets) that can be inserted into Pages. They are used to display information from both SharePoint and third party applications. Each item in a library or list is a content item. Examples of content items include "Document" - which may have a "Name", "Contact" - with contact information fields, or "Sales Invoice" - with fields such as "Total" and "Customer ID". Content Types are definitions (or types) of items. These definitions describe things like what metadata fields a Document, Contact, or Invoice may have. SharePoint allows you to create your own definitions based on the built-in ones. Some built in content types include: Contacts, Appointments, Documents, and Folders. Some built-in content types such as 'contact' or 'appointment' allow the list to expose advanced features such as Microsoft Outlook or Project synchronization. In SharePoint 2013, in some locations, Lists and Libraries were renamed 'Apps' (despite being unrelated to the "SharePoint App Store"). In SharePoint 2016, some of these were renamed back to Lists and Libraries. SharePoint is primarily configured through a web browser. The web-based user interface provides most of the configuration capability of the product. Manipulate content structure, site structure, create/delete sites, modify navigation and security, or add/remove apps. Enable or disable product features, upload custom designs/themes, or turn on integrations with other Office products. Configure basic workflows, view usage analytics, manage metadata, configure search options, upload customizations, and set up integration. SharePoint Designer is a semi-deprecated product that provided 'advanced editing' capabilities for HTML/ASPX pages, but remains the primary method of editing SharePoint workflows. A significant subset of HTML editing features were removed in Designer 2013, and the product is expected to be deprecated in 2016-7. Microsoft SharePoint's Server Features are configured either using PowerShell, or a Web UI called "Central Administration". Configuration of server farm settings (e.g. search crawl, web application services) can be handled through these central tools. While Central Administration is limited to farm-wide settings (config DB), it provides access to tools such as the 'SharePoint Health Analyzer', a diagnostic health-checking tool. In addition to PowerShell's farm configuration features, some limited tools are made available for administering or adjusting settings for sites or site collections in content databases. A limited subset of these features are available by SharePoint's SaaS providers, including Microsoft. The SharePoint Framework (SPFX) provides a development model based on typescript language. The technical stack is yeoman, node.js, webstack, gulp, npm. It embraces modern web technologies development method. It is the only supported way to customize the new modern experience user interface (UI). It is globally available since mid 2017. It allows web developer to step in Sharepoint development more easily. The SharePoint "App Model" provides various types of external applications that offer the capability to show authenticated web-based applications through a variety of UI mechanisms. Apps may be either "SharePoint-hosted" , or "Provider-hosted". Provider hosted apps may be developed using most back-end web technologies (e.g. ASP.net, NodeJS, PHP). Apps are served through a proxy in SharePoint, which requires some DNS/certificate manipulation in on-premises versions of SharePoint. "Sand-boxed" plugins can be uploaded by any end-user who has been granted permission. These are security-restricted, and can be governed at multiple levels (including resource consumption management). In multi-tenant cloud environments, these are the only customizations that are typically allowed. Farm features are typically fully trusted code that need to be installed at a farm-level. These are considered deprecated for new development. Extensions to SharePoint functionality (e.g. custom workflow actions). 'Web Parts' (also known as "portlets", "widgets", or "gadgets") that provide new functionality when added to a page. SharePoint Server can be scaled down to operate entirely from one developer machine, or scaled up to be managed across hundreds of machines. Web applications (WAs) are top-level containers for content in a SharePoint farm. A web application is associated primarily with IIS configuration. A web application consists of a set of access mappings or URLs defined in the SharePoint central management console, which are replicated by SharePoint across every IIS Instance (e.g. Web Application Servers) configured in the farm. A site collection is a hierarchical group of 'SharePoint Sites'. Each web application must have at least one site collection. Site collections share common properties (detailed here), common subscriptions to service applications, and can be configured with unique host names. A site collection may have a distinct content databases, or may share a content database with other site collections in the same web application. Service applications provide granular pieces of SharePoint functionality to other web and service applications in the farm. Examples of service applications include the User Profile Sync service, and the Search Indexing service. A service application can be turned off, exist on one server, or be load-balanced across many servers in a farm. Service Applications are designed to have independent functionality and independent security scopes. SharePoint's architecture enables 'least-privileges' execution permission model. SharePoint Central Administration (the CA) is a web application that typically exists on a single server in the farm, however it is also able to be deployed for redundancy to multiple servers. This application provides a complete centralized management interface for web & service applications in the SharePoint farm, including AD account management for web & service applications. In the event of the failure of the CA, Windows PowerShell is typically used on the CA server to reconfigure the farm. SharePoint integrates with Microsoft Office. SharePoint uses Microsoft's OpenXML document standard for integration with Microsoft Office. Document metadata is also stored using this format. SharePoint can be used to achieve compliance with many document retention, record management, document ID and discovery laws. SharePoint is compatible with CMIS - the Content Management Interoperability Standard, using Microsoft's CMIS Connector. SharePoint has support for XLIFF to support the localization of content in SharePoint. Also added support for AppFabric. SharePoint evolved from projects codenamed "Office Server" and "Tahoe" during the Office XP development cycle. "Office Server" evolved out of the FrontPage and Office Server Extensions and "Team Pages". It targeted simple, bottom-up collaboration. "Tahoe", built on shared technology with Exchange and the “Digital Dashboard”, targeted top-down portals, search and document management. The searching and indexing capabilities of SharePoint came from the "Tahoe" feature set. The search and indexing features were a combination of the index and crawling features from the Microsoft Site Server family of products and from the query language of Microsoft Index Server. GAC-(Global Assembly Cache) is used to accommodate the shared assemblies that are specifically designated to be shared by applications executed on a system. SharePoint Foundation 2013 (free), SharePoint Server 2013 (extension on top of Foundation), and SharePoint Enterprise 2013. SharePoint Server 2016 and SharePoint Enterprise 2016. SharePoint Server 2019 and SharePoint Enterprise 2019. New UI with Fluent Ribbon, using wiki-pages rather than 'web-part pages' and offering multi-browser support. Restructure of "Shared Service Providers" - Introduction of "Service Applications" SOA model. ^ "Hardware and Software Requirements for SharePoint 2019". Microsoft TechNet. Microsoft Corporation. July 24, 2018. Retrieved October 23, 2018. ^ "Install or uninstall language packs for SharePoint Servers 2016 and 2019". Microsoft Docs. Microsoft Corporation. Retrieved December 17, 2018. ^ a b Oleson, Joel (28 December 2007). "7 Years of SharePoint - A History Lesson". Joel Oleson's Blog - SharePoint Land. Microsoft Corporation. MSDN Blogs. Archived from the original on 13 August 2011. Retrieved 13 August 2011. ^ "SharePoint 2016, Team Collaboration Software Tools". products.office.com. Retrieved July 19, 2017. ^ "What's deprecated or removed from SharePoint Server 2016". technet.microsoft.com. Retrieved November 8, 2016. ^ "SharePoint 2010 Editions Comparison -Sites". Microsoft SharePoint 2010 Marketing Website. Microsoft. Retrieved August 13, 2011. ^ "SharePoint 2010 Editions Comparison - Communities". Microsoft SharePoint 2010 Marketing Website. Microsoft. Retrieved August 13, 2011. ^ "SharePoint 2010 Editions Comparison - Content". Microsoft SharePoint 2010 Marketing Website. Microsoft. Retrieved August 13, 2011. ^ "SharePoint 2010 Editions Comparison-earch". Microsoft SharePoint 2010 Marketing Website. Microsoft. Retrieved August 13, 2011. ^ "SharePoint 2010 Editions Comparison -Composites". Microsoft SharePoint 2010 Marketing Website. Microsoft. Retrieved August 13, 2011. ^ "SharePoint 2010 Editions Comparisondfdf534". Microsoft SharePoint 2010 Marketing Website. Microsoft. Retrieved August 13, 2011. 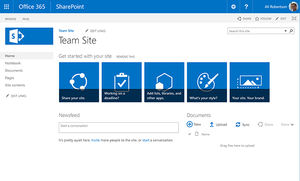 ^ "SharePoint Online – Collaboration Software". products.office.com. Retrieved July 24, 2016. ^ "Is SharePoint the same as Office 365?". www.fpweb.net. Retrieved February 8, 2018. ^ "Compare SharePoint Plans and Options". Microsoft Office. Microsoft. Retrieved January 29, 2015. ^ "Microsoft FastTrack". fasttrack.microsoft.com. Retrieved July 24, 2016. ^ "Start Building a SharePoint Governance Plan in the Real World | Sharegate". Retrieved July 24, 2016. ^ "SharePoint – Team Collaboration Software Tools". Microsoft Office. Retrieved May 19, 2015. ^ VibeThemes (March 6, 2013). "SharePoint versus Network File Share (NFS)". Retrieved July 24, 2016. ^ <ldusseault@commerce.net>, Lisa Dusseault. "HTTP Extensions for Web Distributed Authoring and Versioning (WebDAV)". tools.ietf.org. ^ SharePoint 2013 development overview. Msdn.microsoft.com (July 16, 2012). Retrieved on 2014-02-22. ^ "Introduction to Content Types". msdn.microsoft.com. Retrieved May 19, 2015. ^ Video: Ribbon highlights In SharePoint 2010. Microsoft Office website. Microsoft. November 30, 2010. ^ "Ignite 2015 Announcement – There will be no SharePoint Designer 2016 - Eric Overfield". Retrieved May 19, 2015. ^ a b SharePoint 2010 for Developers. SharePoint website. Microsoft Corporation. Retrieved August 13, 2011. ^ a b c d e "Logical architecture components (SharePoint Server 2010)". Technet. Microsoft. Retrieved August 13, 2011. ^ "Host-named site collection architecture and deployment (SharePoint 2013)". Retrieved April 25, 2017. ^ Holme, Dan. "Least Privilege Service Accounts for SharePoint 2010". SharePoint Pro Magazine. Penton Media. Retrieved August 13, 2011. ^ McNelis, Zack. "SharePoint 2010 – Compliance Everywhere". Technet Blogs - Zach McNelis. Microsoft. Retrieved August 13, 2011. ^ "FAST Solution Center". Support. Microsoft. Retrieved February 2, 2014. ^ "FAST Search Server 2010 for SharePoint". Microsoft TechNet. Microsoft. May 12, 2010. Retrieved February 2, 2014. ^ "Manupatra Information Solutions". Microsoft Case Study. Microsoft. February 17, 2013. Retrieved February 2, 2014. ^ "Sharepoint History". MSDN. Microsoft corporation. October 5, 2009. Retrieved December 2, 2010. ^ How-To Videos - Microsoft Office. Microsoft.com. Retrieved on February 22, 2014. ^ "New and improved features in SharePoint Server 2016". technet.microsoft.com. Retrieved September 19, 2016. ^ "New Features in SharePoint 2016 - Overview - Centillion Technology Systems". April 6, 2016. Retrieved September 19, 2016. ^ "Announcing General Availability of SharePoint Server 2019". techcommunity.microsoft.com. Retrieved October 23, 2018.